Your boat will go only as far as your boat propeller will take it out on the Minnesota waters. The minute you notice your propeller acting strange, it is important that you contact boat repair experts in Minnesota. Conveniently, the number one repair shop in the Minneapolis/St Paul MN area, Anchor Marine Repair, specializes in propeller mount repairs for boats of all shapes and sizes. Some types of propeller damage is unavoidable. Unfortunately, there may be a time during the life of your boat where you come into contact with damaging debris or rocks in the water that you never even saw coming. Additionally, regular wear on your propeller mount can be caused by simply using your boat regularly. Small dings and chips of the propeller over time can build up into a larger issue. That is why it is important to regularly examine your propeller mount to ensure that there is not any noticeable damage. Lastly, entering and removing your boat from the nearby Minnesota lake and getting it on and off a boat trailer can sometimes cause you to need propeller mount repairs. There are some types of damage to your boat that you can leave unaddressed for a while. Your propeller mount however, is not one of those items. A damaged propeller mount negatively affects the life of your engine, comfort, speed of your boat, mileage, safety and overall performance. One sign that your propeller mount may be damaged is feeling constant vibrations while you are traveling the Minnesota waters. At Anchor Marine Repair, our team has over 45 years of combined experience in the boat repair industry. Our staff knows just how important the propeller mount is to your boat, so we take extra precautions to ensure that it is repaired to better than pre-accident condition. We have worked with all types of propellers and boats and can tackle your repair project quickly so that you can get your boat back out on the Minnesota water soon. We offer free estimates on all of our boat repairs, so what do you have to lose? 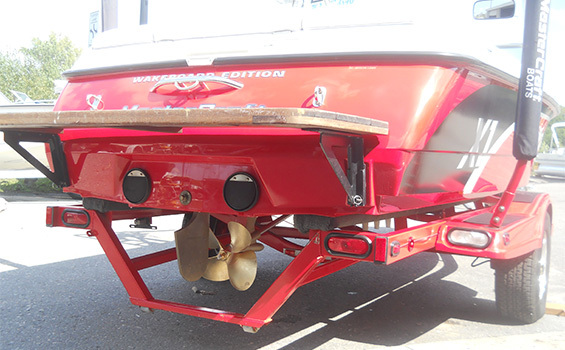 If you are worried that your boat propeller mount may be damaged, team up with the boat repair specialists in Minnesota at Anchor Marine Repair. Give us a call today at (763) 972-3540 or email service@anchormarinerepair.com to set up a free estimate on your boat propeller mount repair needs.